Emerson Etem is Broadway-bound. The swift winger was dispatched by the Anaheim Ducks, along with a high second-round pick to the New York Rangers for the lightning-quick Carl Hagelin on Day 2 of the NHL draft. 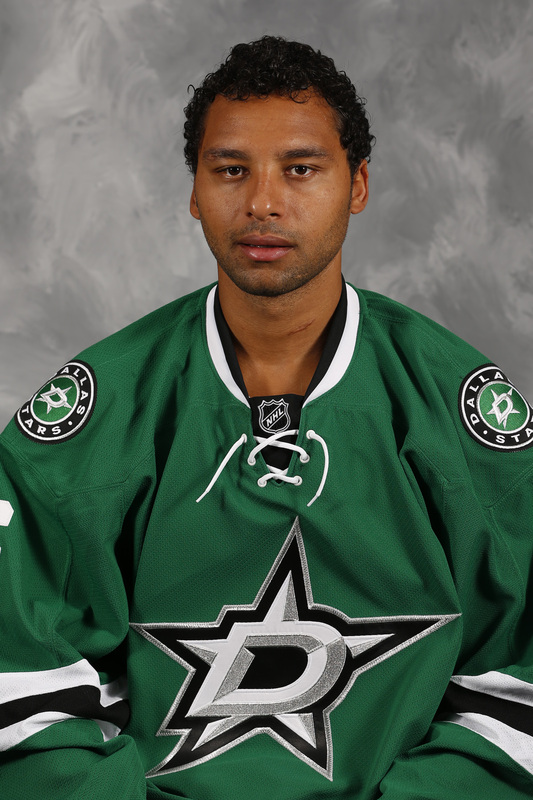 Forward Emerson Etem goes from the pond of Anaheim to Broadway in draft day trade. Etem, 23, scored one of the more dazzling goals of the playoffs last season, dancing by Winnipeg defenseman Jacob Trouba and finishing with a flourish against Jets goalie Ondrej Pavelec. Etem, born in Southern California, had five goals and five assists last season in 45 games for the Ducks. He will be the only player of color on the Rangers, who dealt the prospect Anthony Duclair last season to the Arizona Coyotes. At 6-foot-1 and 206 pounds, Etem brings more of a physical presence to New York than Hagelin, one of the fastest skaters in the NHL. Good coaches help make great hockey players. T.R. Goodman builds great hockey players. For more than two decades, Goodman has been the go-to summer trainer for some of the National Hockey League’s biggest stars. Players such as 2013 Hockey Hall of Fame inductee defenseman Chris Chelios, Hall of Fame forward Mario Lemieux of the Pittsburgh Penguins, former Norris Trophy-winning defenseman Rob Blake, and former All-Star forwards Rick Tocchet and Jeremy Roenick routinely made the post-season pilgrimage to Venice Beach, California, for weeks of physical recouperation and insanely intense low-impact workouts under Goodman – a regimen that several credited with prolonging their careers. Trainer T.R. Goodman putting former NHLer Jeremy Roenick through his paces. The 2013 summer class at Goodman’s Pro Camp Sports included Anaheim Ducks right wing Emerson Etem and Brett Beebe, a right wing from Western Michigan University who signed a contract to play this season for the ECHL’s Ontario Reign, a Los Angeles Kings farm club. Both Etem and Beebe are among the growing number of professional hockey players who are born, raised, and began playing the game in the Golden State. Etem’s desire and dedication to train with Goodman has already become legend. The two have worked together since Etem was barely 14 and too young to drive. So to get from his Long Beach home to Goodman’s Venice Beach gym, Etem would wake up at 6 a.m., rollerblade to a nearby train station, hop a train, transfer to a bus, then put back on his rollerblades and skate the last mile of the 2 1/2-hour journey to the gym. Then he would work out. Etem’s effort to get to Goodman’s gym may be why the 52-year-old Connecticut native considers the 21-year-old California kid one of his all-time favorite clients. Etem, the 29th overall pick in the 2010 NHL Draft, scored 3 goals and 7 assists in 38 games for the Ducks last season. He registered 3 goals and 2 asists in seven playoff games for Anaheim. In 2011-12, he scored 61 goals and 46 assists in 65 games for the Medicine Hat Tigers, a major junior team in the Western Hockey League. Goodman believes Etem is on the cusp of stardom. 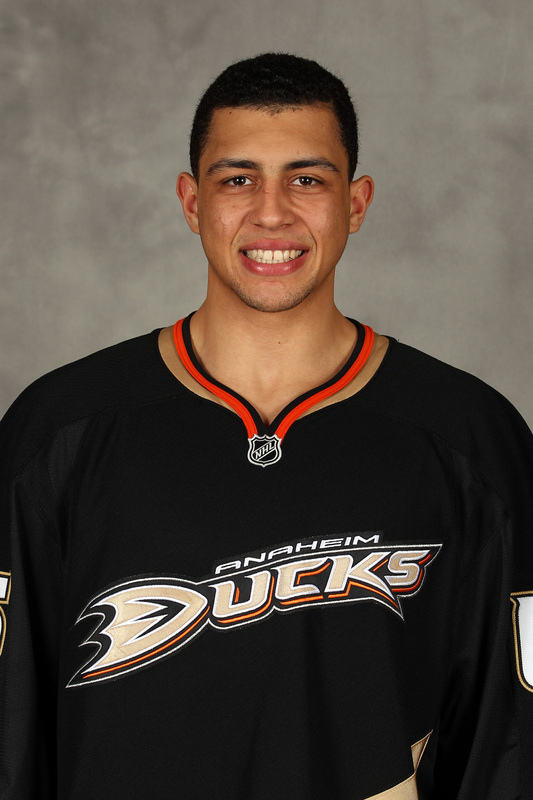 Goodman predicts big things for Ducks’ Emerson Etem in 2013-14. What Goodman asks Etem and other clients to do is endure a rigorous three-phase workout program that begins after the NHL season ends and ends before training camp starts in September. The phases focus on repairing the physical trauma and injuries incurred during the long hockey season, strenthening core muscles, and concentrating on muscular growth and endurance. That’s done through a series of low-impact exercises repeatedly performed at a non-stop pace for 60 minutes. Even for the best-conditioned athlete, Goodman’s workout can be a vomit-inducing, knee-wobbling, muscle-burning experience. But the outcome is a strong, well-defined but flexible body able to withstand the rigors of an 82-game NHL season and the Stanley Cup Playoffs. Goodman and a sweat-drenched Chris Chelios take a workout break. Goodman once had NHL aspirations himself. He was a team captain for the Trinity College Bantams hockey team in the 1981-82 and 1982-83 seasons. He scored 35 goals and a career-high 60 assists in 1982-83 for the small Hartford, Conn., college – good numbers but not good enough to draw attention from NHL teams. And being African-American, “I had like two strikes against me,” Goodman added with chuckle. By the 1982-83 season, only one U.S.-born black player had reached the NHL – puglistic left wing Val James of the Buffalo Sabres. 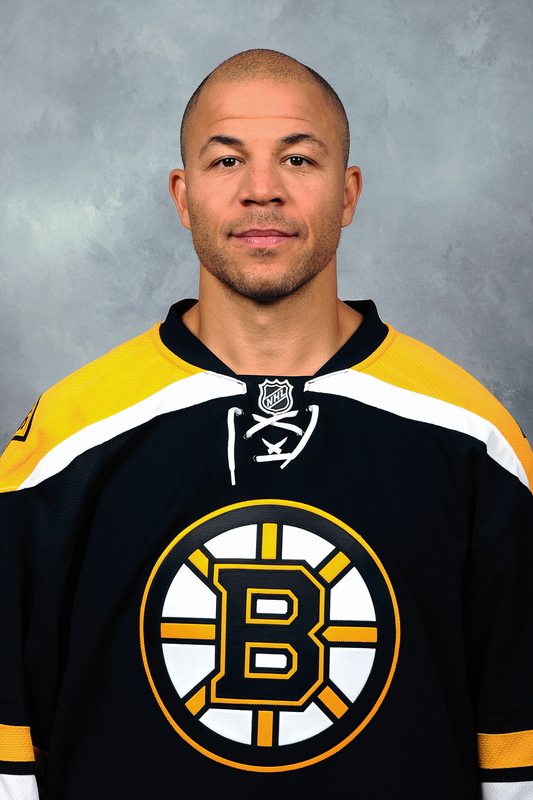 In all, six black players had logged time with NHL teams by the time Goodman completed college: forward Willie O’Ree of the Boston Bruins, left wing Mike Marson and right wing Bill Riley of the Washington Capitals, right wing Ray Neufeld of the Hartford Whalers, Tony McKegney of the Buffalo Sabres and Buffalo’s James. Quebec Nordiques right wing Bernie Saunders, brother of ESPN broadcaster John Saunders, and Los Angeles Sharks wing/center Alton White, played in the rival World Hockey Association during that time. So Goodman took his degree in economics and hockey gear and headed West. Goodman got his first workout client in 1992: Washington Capitals left Wing Alan May. Word of Goodman’s handiwork hit the NHL player grapevine and more players signed up to be tortured – er, trained – by him. During the NHL season, Goodman finds himself glued to the television monitoring how his clients are doing and studying whether they are keeping up with their exercise regimen.